In the food and beverage sector, hygiene is a key pre-requisite for safe, legal production. Not only must production areas and surfaces be subjected to a rigid and carefully managed cleaning regime, but the containers used to store and dispense products must be effectively cleaned to ensure the contents retain their quality and taste and are not harbouring dangerous bacteria. This is amply illustrated in beverage production where kegs must be thoroughly cleaned before they can be filled with wine, beer, soft drinks, water or juices. Methods for this process range from semi-automatic individual cleaning and filling machines to fully automatic keg paths. With more than 5,500 employees, KHS, based in Dortmund, Germany, is a global market leader in technologically innovative, high-quality filling and packaging systems for the food and beverage sector. It specialises in the production of keg cleaning and filling systems capable of handling 500 to 1,500 kegs/hour. The company was seeking a new technology partner for its INNOKEG TILL COMBIKEG machines. These extremely compact keg cleaning and filling machines combine internal and external keg cleaning, chemical supply, control and transport. 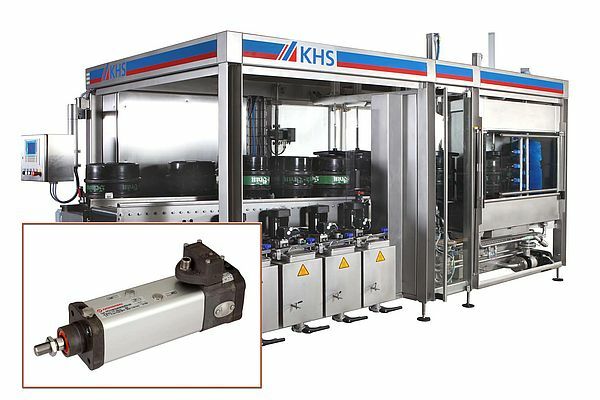 What KHS was seeking was an efficient solution to deliver precise, consistent keg contact pressure on the treatment head during all phases of the process. This task was solved with the IVAC Clean Line cylinder from Norgren, an international market leader in pneumatic motion and fluid control technology. The space-saving IVAC pneumatic cylinder was provided as a completely ready-for-connection unit with integrated main and pilot valves, magnet switch, speed control and a central connection for compressed air and electricity. This meant the piping and connections previously used to link the cylinder and the valve were no longer necessary, saving significantly on energy usage. Indeed, it is estimated that replacing traditional pipework and connections with IVAC technology can reduce energy usage by up to 40 per cent, depending on the application. IVAC is a dual-action pneumatic cylinder with monostable 5/2 directional valve which conforms to ISO 15552 and can be easily and smoothly integrated into existing systems with standard fastening elements - creating significant reductions in installation and operating costs. The cylinder meets the key hygiene standards required in the food and beverage sector by using standard food grade lubricant. All adjusting screws are covered.